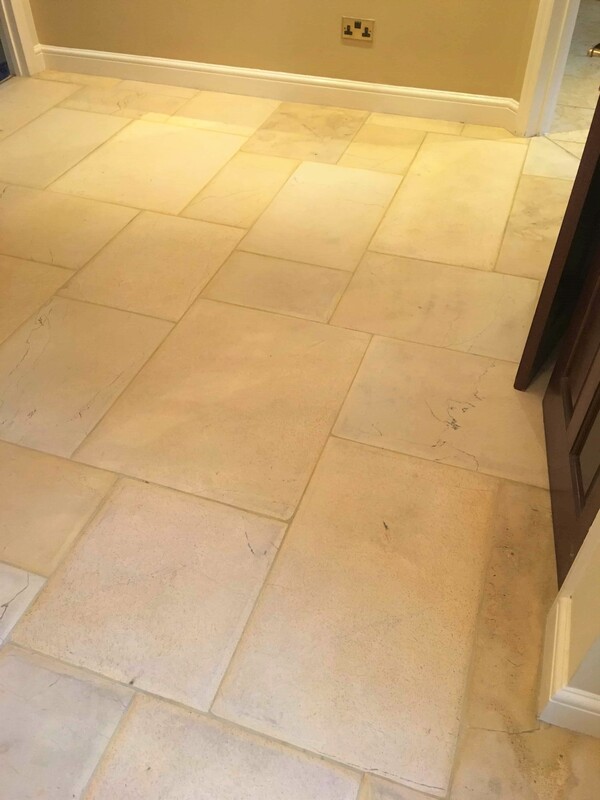 These unpolished Limestone tiles were installed in the hallway of a property in Twickenham, Middlesex. The stone had not been cleaned or sealed for six years and being the main entrance to the house it was subject to a lot of foot traffic which had taken its toll on the stone over the years. As you can see from the photos, dirt was ingrained in the stone which happens when the protective sealer wears off with use. They had chosen to cover the floor with some rugs to improve the appearance and make the hall more inviting and as you can see especially where the rugs had been protecting the Limestone there was a visible difference in colour. Twickenham is a suburb of London and of course most famous for being the home of Rugby Union in England and a short distance from by base in Shepperton so it wasn’t long before I was able to pop in and survey the floor. I discussed with the client what could be done to clean the floor and demonstrated the products and technique I would use on a test patch. They were suitably impressed, and we agreed a price for the work and booked a time to complete the job. The job was scheduled for two days, one day to clean and the second to seal the floor. 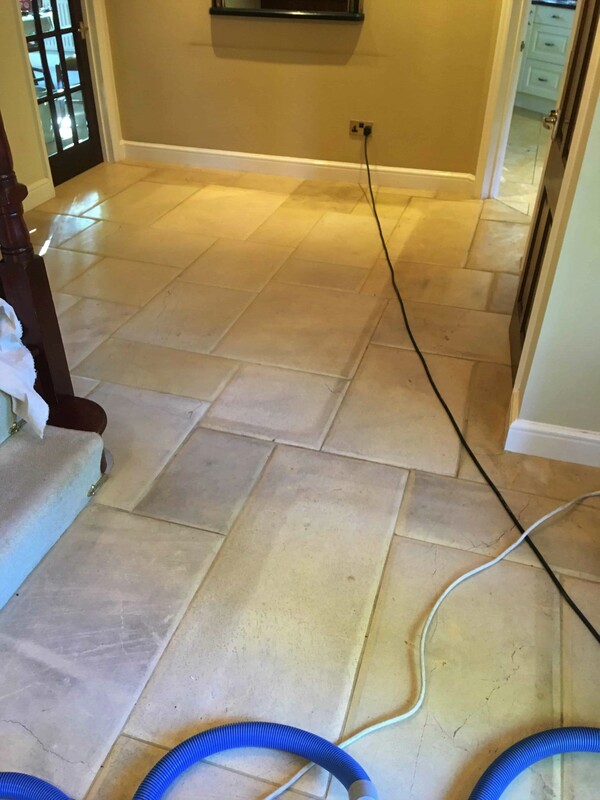 To start with, we pre-sprayed the tiles with Tile Doctor Remove and Go and left it to soak in for ten minutes, this allows the product to break down any remaining sealant and greasy soils. Then we machine scrubbed the floor with our rotary cleaner fitted with a black scrubbing pad lubricated with another Tile Doctor product, Pro-Clean. This strong alkaline chemical breaks down the dirt and leaves it ready to be rinsed away. 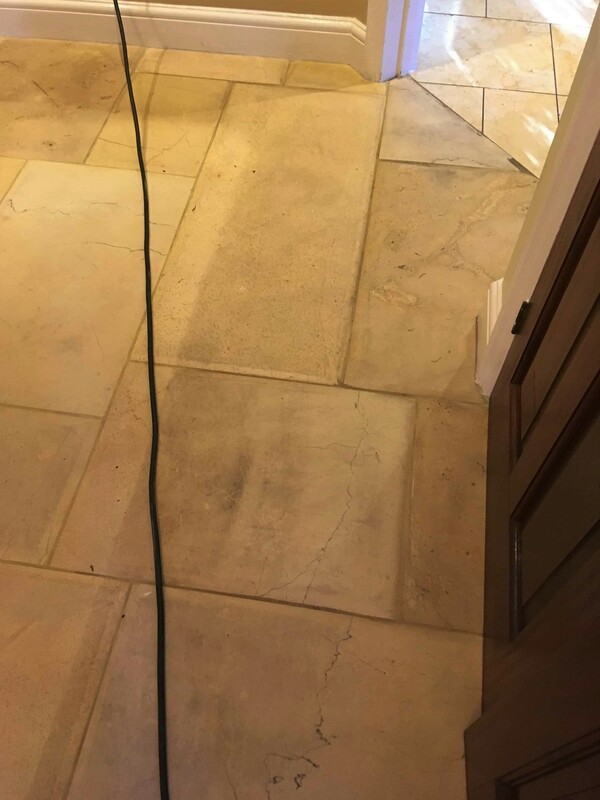 The grout lines were also cleaned using Tile Doctor Pro-Clean but not with a machine as the pad struggles to reach down into the grout lines, so it was scrubbed by hand to give the best result. Following the clean, we low pressure rinsed the floor with water and vacuumed all the residue away, leaving the floor ready for sealing. The Limestone tiles and grout looked much better already after cleaning and it was left to dry overnight. Returning to the property the next day our first action was to check the moisture levels in the floor with a damp meter. All was well so we to apply three coats of Tile Doctor Colour Grow. This is an impregnating sealer that protects the stone from within by occupying the pores in the stone, so dirt can’t become lodged there. The sealer will make the floor much easier to keep clean in future and as the name of the product suggests it also enhances the natural colours in the tile. 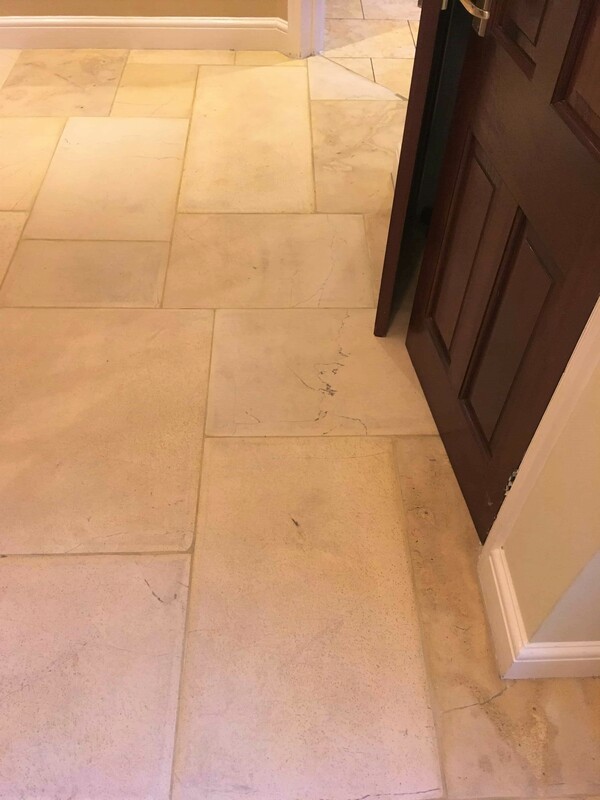 For the aftercare of unpolished Limestone, I recommend Tile Doctor Neutral Cleaner which is designed for the cleaning of sealed Tile and Stone. If using a different product always read the label first as many cleaners are too strong for use on sealed surfaces and will strip off the sealer over time. The client was very happy with the result and felt they could now keep on top of keeping it clean and looking fresh moving forward. They could now remove the rugs too! 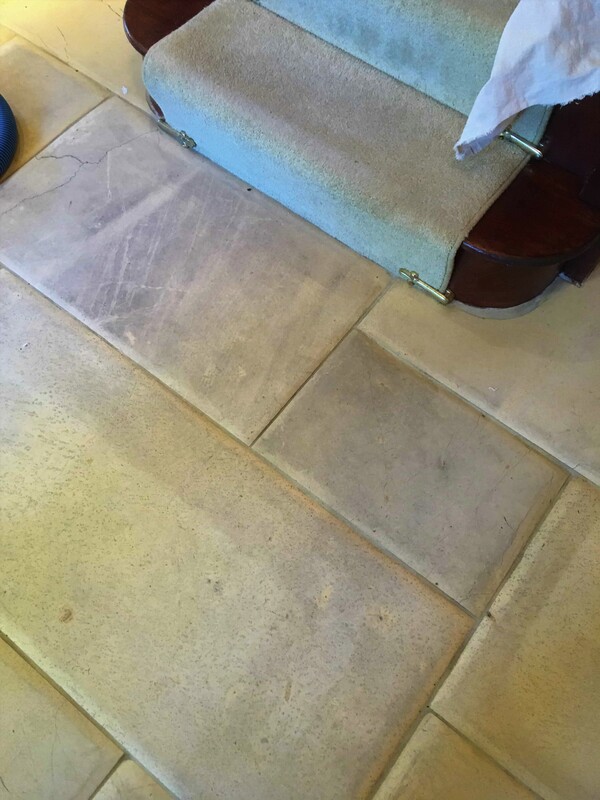 If you require a free quotation to clean and seal your stone floors do get in touch.